The “Transition Team” is eager to speak with you – to all the members and friends of the West Gloucester Trinitarian Congregational Church (WGTCC) – about our church & what the Holy Spirit is calling us to be and do. Your thoughts, prayers, and willingness to lend a hand will help the Transition Team write the Church Profile, and help the Search Committee (yet to be formed) discern who to call as our next Pastor. In May and June, smaller discussion groups will be held in people’s homes. (If you would like to host a small gathering, please speak with a member of the Transition Team.) Your thoughts are very important to us! Please join the conversation on April 24th!. The sympathy of the church family is extended to the family of F. Chester Roberts. GLOUCESTER- F. Chester Roberts, 97, of Gloucester, passed away Wednesday afternoon, March 6, 2019, at the Gloucester Healthcare Nursing Home in Gloucester. He was the beloved husband of the late Lydia (Bevilacqua) Roberts. Born in Ipswich, he was the son of the late Edward F. and Marion F. (Andrews) Roberts. He was a graduate of Gloucester High School with the class of 1938. He continued his education by attending the New England Conservatory of Music in Boston, supporting himself by several jobs including two summers at Tip Top House on Mt. Washington and clamming including being down-river on the day of the great hurricane of 1938. In 1942 with the country plunged in a World War, Chester decided to attend Officer’s Candidate School in FL and Yale University in CT. He graduated from Yale with the rank of 2nd Lieutenant. In early 1943 he was shipped to New Guinea as an aircraft maintenance officer for the remainder of the war. Upon his honorable discharge in 1946 he was promoted to 1st Lieutenant. 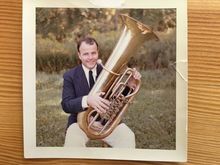 A casual meeting with an old acquaintance informed Chester of an opening for Tuba in the Pittsburg Symphony Orchestra, he auditioned, got the job and held it for five years. An opening arose in the Cleveland Symphony Orchestra under the baton of George Szell and he spent the next fifteen years playing with them. Upon his return to Gloucester, he bought a home and began teaching at Gordon College in Wenham and other schools in Boston. Although retired, his love of music led him to play in the Rockport Legion Band for many years. He is survived by his brother, Eugene A. Roberts and his wife Nancy of Essex and many nieces, nephews, great-nieces and great-nephews. In lieu of flowers, donations in Chester’s name may be made to the West Gloucester Trinitarian Congregational Church, 488 Essex Avenue, Gloucester, MA 01930. Arrangements by the Campbell Funeral Home, 61 Middle Street, Gloucester. A memorial service is to be held in the church on Saturday, May 4, 2019, at 11:00 a.m., relatives and friends are invited to attend. I am offering a DVD-based course of Lenten Bible Study, exploring Jesus’s last days in the context of the places and events in Israel when the events were reported. We will meet on Sunday mornings at 9:00 A.M., beginning on March 17th, and Thursday afternoons at 5:30 P.M. starting on March 14th. Please let me know if you are interested in being part of this 6-week study, either by email to me at revteriwgtcc@gmail.com or by leaving a message on the Church telephone (978) 283-2817. Support Our New Neighbors NOW! Can you imagine leaving everything behind—family, friends, profession, school, community, language, culture, climate, geography—and starting over from scratch? That’s exactly what so many newcomers to our community from foreign lands have had to do. On Cape Ann right now we have neighbors who have escaped violence an war in the Middle East, Asia, Central America, and Africa. Safe at last, they are eager to provide for their children and become contributing members of our community. They are the new Americans. Local individuals and faith communities have reached out to help in amazing ways, and the families have made a good start finding employment, pursuing higher education, learning English, etc. The young children are enrolled in school and community activities and are making friends. · ACCESS necessary employment, vocational and social services. Funds will be collected by the West Gloucester Trinitarian Congregational Church, UCC. Once immediate and specific short-term needs are met, remaining dollars will be used to enhance the family support programs of Wellspring House to better meet the needs of newly arriving immigrant families on Cape Ann. The stories of these new families may differ in details from our own, but most of us owe our own good fortune to the kindness of others who reached out to our ancestors or us when we were newcomers. However, unlike our parents and grandparents who were supported by cousins and countrymen and women, these refugees have no relations nearby to rely on. But they do have us. Please be generous. All gifts are tax-deductible. IF YOU ARE AN AMAZON SHOPPER, BY USING THE LINK: SMILE.AMAZON.COM YOU WILL BE GIVEN THE OPPORTUNITY TO SELECT A FAVORITE CHARITY TO RECEIVE 0.5% OF YOUR PURCHASE TOTAL FROM ALL QUALIFIED PURCHASES. IF YOU WISH FOR THE CHURCH TO RECEIVE THE CREDIT, THE NAME THAT IS REGISTERED FOR OUR CHARITABLE ORGANIZATION IS WEST GLOUCESTER TRINITARIAN CONGREGATIONAL CHURCH (YOU MUST ENTER THE FULL NAME) AND IF YOU SET IT AS YOUR PREFERRED CHARITY YOU WILL NOT HAVE TO RE-ENTER IT EACH TIME. THERE IS NO COST TO YOU TO DO THIS. THE CONTRIBUTIONS ARE MADE BY THE AMAZON FOUNDATION AND ARE THEREFORE NOT TAX-DEDUCTIBLE TO YOU, THE PURCHASER; HOWEVER, IT COSTS YOU NOTHING TO TAKE ADVANTAGE OF THIS OPPORTUNITY. IF YOU ARE AN AMAZON PRIME SHOPPER, IT WILL NOT NEGATIVELY AFFECT THE SHOPPING ADVANTAGES OF YOUR PRIME ACCOUNT. Celebrate with the Open and Affirming Coalition of the United Church of Christ as we welcome our newest Open and Affirming (ONA) congregation: West Gloucester Trinitarian Congregational Church, UCC, Gloucester, MA. The ONA church number indicates the position of this church in the chronology of all ONA churches listed since 1985. We all want and need to build stronger relationships with one another: getting to know each of the covenant partners in this relationship is important. Please welcome and share information about yourself, get to know one another and be in ministry together seeking justice for all in Jesus’ name. We, the congregation of the West Gloucester Trinitarian Congregational Church, United Church of Christ, believe that every person is beloved of God, a special and unique creation made in God’s own image. Therefore, we declare ourselves to be an Open and Affirming (ONA) congregation. With God’s grace, we commit ourselves to embrace diversity and encourage and support the participation of persons of every gender, marital status, sexual orientation, gender identity, gender expression, age, mental and physical ability, as well as racial, ethnic and socio-economic background. We welcome all persons, members and friends, to share in the full life and ministry of this church both lay and ordained, including fellowship, worship, sacraments and ceremonies and celebrations; in the shared responsibilities of stewardship and living in a covenantal relationship; in the shared blessings of the right to marry or celebrate a commitment to a person of one’s choosing, in the right to celebrate a loved one’s life in a memorial service; and to receive pastoral care. At the WGTCC we believe in God’s inclusive love for all which means that no matter who you are or where you are on life’s journey you are welcome here. Recognizing that we are called together by God to follow in the ways of Christ, and recognizing the words of Holy Scripture (Colossians 3: 12-17 and 1 Thessalonians 5: 12-24) we covenant with one another to live together in loving relationships. With God’s help, we will hold ourselves and one another to the following values and guidelines as we seek to live in community together. We seek to build each other up and not tear down. We respect and honor our pastor and lay leaders. We seek to communicate clearly, listening to one another and honoring what the other is saying. We offer our opinions with charity and humility. We make positive investments in each other’s lives by recognizing one another’s spiritual gifts and seeking to nurture them. We seek to discover not what may be best for the individual or the small group but what is best for God’s church as a whole. We accept disagreement, conflict and evolution as normal and natural and we will deal with them in a kind, open and loving way. We commit to being inconvenienced for the sake of the Gospel. We seek to respect people’s lives, affirming that it is acceptable to come to church and just be. We seek and extend grace and forgiveness in relationship with each other.